I earned my undergraduate degree from Indiana State University (B.A. Criminal Justice) and my law degree from the University of Pittsburgh School of Law (J.D., Civil Litigation Program). I focused on civil litigation during law school and was a founding member of the Civil Litigation Program. During law school I worked as a law clerk for my current law firm and became a partner in 2005 at Eddy DeLuca Gravina & Townsend. I have extensive experience in complex litigation in both state and federal courts. Routinely I facilitate and speak for the Pennsylvania Bar Institute on a wide range of topics, educating others in the legal community on new and ever-changing laws and regulations. I sit as on the Board of Directors for Riverside Center for Innovation, which opened in 1992 to promote and foster the growth of entrepreneurial enterprises. RCI consists of strategic synergies among our businesses to provide a virtual company including accounting, public relations, risk management, research and real estate ventures. 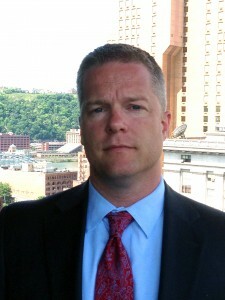 I also help form the Veteran’s Court in Allegheny County. This program was one of the first of its kind in Pennsylvania. I have practiced in several areas of law but I have devoted the majority of my practice to the Marcellus Shale industry. As co-founder of ShaleAdvice, LLC, I saw the need for a true landowner advocate. I represent landowners exclusively in all aspects of the oil and gas industry. As a founding partner of ShaleAdvice, I have successfully litigated and resolved many types of disputes that are particular to the operations of oil and gas companies. I have represented clients in quiet title actions, easement disputes, surface access disputes, pipeline and marketing disputes, litigation regarding breaches of oil and gas leases and joint operating, consulting, and confidentiality agreements. Since forming ShaleAdvice, I have taken on the oil and gas giants with great success. I am proud of the work we have done, and will continue to devote my practice to the protection of landowners and royalty owners before, during and after the drillers are long gone.